[JSDSERVER-40] Buttons for workflow transitions on Customer Portal - Create and track feature requests for Atlassian products. Great news! This feature is now be available on cloud! Server customers will get it in the next server release (3.2.0) very very soon! Hello! Thank you for all your continuous feedback on this feature! For those who wants to use this feature for approval purposes, we recently launched an approval feature in JSD. This approval feature allows more complex approval processes and will lock down the transitions properly for non-approvers. For more information please have a look at our documentation . For the rest of you, we are in the implementation phase for the design shared earlier so it will be coming soon! Just thought we will give you guys a sneak peak into what is coming. Since the last time we updated our design team have came up with some design for this feature! We want to hear your thoughts on them and here's a survey for you to give feedback: a short survey. I have attached some screenshots on this ticket with our designs. We love your feedback, so please fill out the survey! 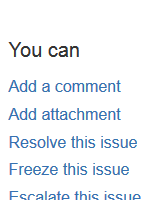 As Reporter of the issue created from Customer Portal I want to have ability of Reopening my issue within my Request on portal, and not going to classic JIRA view of the issue to do so. This is example of classic workflow, but there could be many of use cases when creator of request should hit some button rather than just sending a comment. JSDSERVER-2352 Adding more options to Customer Portal under "You can"
JSDSERVER-778 How can we get "resolve issue","close issue" links in servicedesk customer portal ?